Moto2 and Moto3 Le Mans Qualifying Round-up : Records fall in France, Folger and Vazquez take first poles. Hot temperatures and no breeze made grip and track temperature key to qualifying in the support classes. Efren Vazquez took pole in Moto3 with the fastest ever lap of Le Mans on a Moto3 bike aboard his SaxoPrint RTG machine, the first pole of his career in his 110thgrand prix weekend. The Honda rider ousted Jack Miller from the top spot and the Australian was visibly annoyed with the riding of others, he was repeatedly the victim of slow racers waiting on the racing line for tow as they looked to the championship leader to help them gain an advantage. The Australians Red Bull KTM is surrounded by Hondas on the front row as third fastest in the session was Estrella Galicia rider Alex Rins, who was lucky not to fall after being smacked into and pushed wide by Juanfran Guevara. Frenchman Alexis Masbou starts his home Grand Prix from fourth despite a crash, while Niklas Ajo gained from the Ajo team bikes leaving the pits in a pack, slipstreaming his way to fifth. Calvo’s Isaac Vinales held on, preventing a fall on the way to sixth. Row three features the second Estrella Galicia bike of Alex Marquez in seventh. Eighth on the Grid is filled by British rider John McPhee, with a late lap allowing Zulfahmi Khairuddin to sneak into ninth. The top ten is completed by title challenger and winner of the last two races, Romano Fenati. Danny Kent starts from 12th on his Red Bull Husqvarna. Moto2 qualifying started with a similar feel when it looked like there would be no significant late claim to the top spot. The riders left it late to make an impact but Jonas Folger snatched pole on his last lap, by a gap of just 0.004. The German gave his AGR team a day to remember with their first pole and his first since stepping up to Moto2. The lap was also a new pole position record for the French circuit in the class. Tito Rabat had been the form rider and lead for much of the session before having to give best to the flying Folger. He was hampered in his progress by a late crash, though the Marc VDS team worked quickly to get their rider back on track. 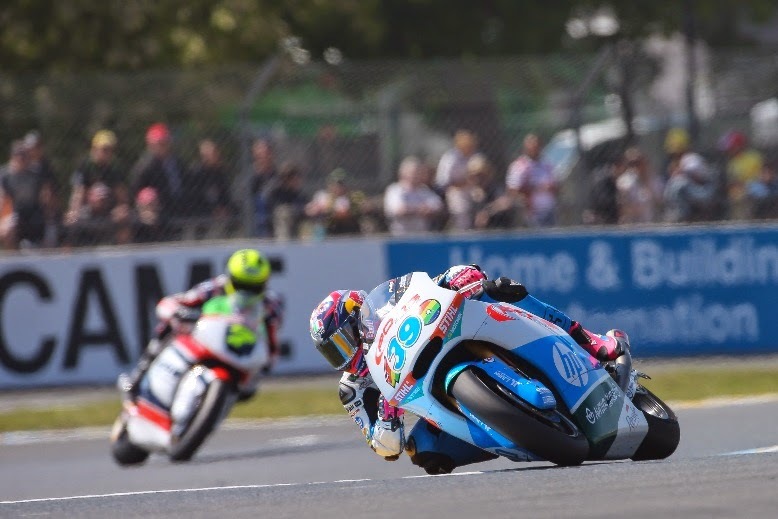 Rabat is the most experienced rider on the front row as third went to another rookie, Pons rider Luis Salom after strong ride on the HP40 Kalex. Mika Kallio, fresh from victory in Spain, will look to perform well from fourth in another strong Marc VDS performance for an all Kalex top four on the grid. Suter rider Tom Luthi sits in fifth ahead of Forward Racing’s Simone Corsi in sixth. Another great rookie ride came from reigning Moto3 champion and Moto2 race winner Maverick Vinales in seventh. The Spaniard is joined by Ricky Cardus in eighth; his best ever grid position, and German rider Sandro Cortese in ninth. Top Briton and top Speed Up rider Sam Lowes completes the top ten. Gino Rea had a better than usual qualification in 23rd, while the top home rider was Louis Rossi in 18th for the SAG Team.